We specialize in drain cleaning and sewer hydro-jetting. The hydro-jet is a high pressure hose that efficiently eliminates debris from clogged drain lines. The high-pressure streams have the strength of cutting through and safely removing tree roots. With our state of the art Hydro-jet system, we will be able to perform clean and quick drain cleaning. 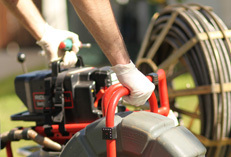 Hydro-jetting is mainly used on sewer lines and grease lines, which can often become congested with sludge and grease. When the sludge and grease have hardened, unclogging with a regular drum sewer machine cable becomes difficult. Our powerful hydro-jet has the capability of removing any blocked-up line with ease and effectiveness.